Posted on January 16, 2009 by Deli Lanoux, Ed.D. During the Christmas holidays, I came across an interesting but disturbing blog post. Having read the December entry, the last sentence rang true. 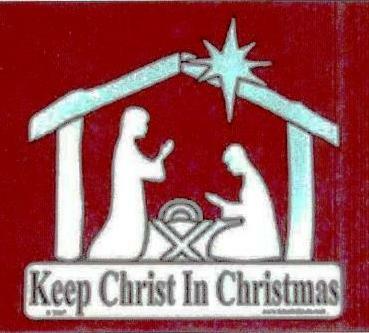 To keep Christ in our daily lives instead of just at Christmas made perfect sense, since I was brought up believing that the spirit of Christmas should be year ’round. I shared the post with Sam and Ning; but the article’s first paragraph grievously offended Ning, and she quickly let me know just that. This is so anti-Catholic! It goes against everything we’re about! 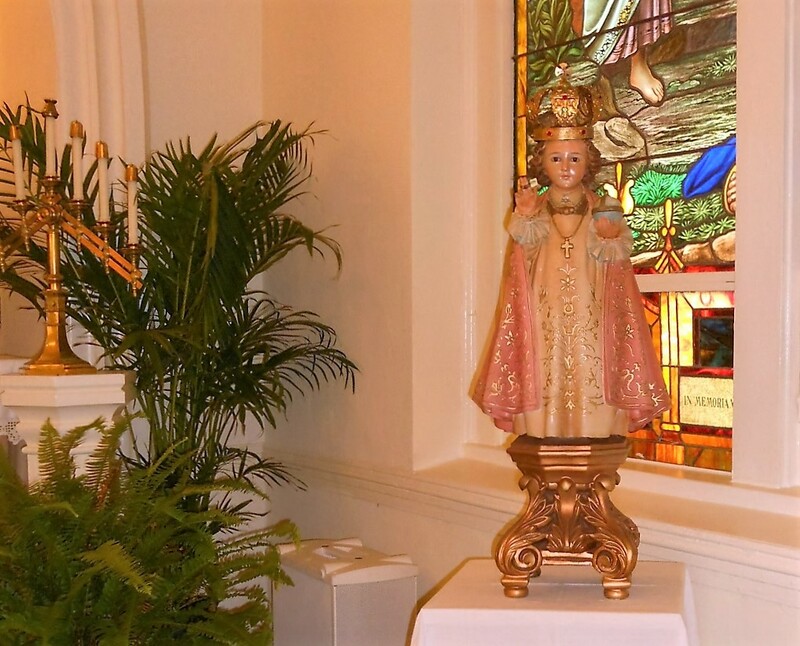 This is why the Filipino community celebrates the Santo Niño. Yes, I agree. 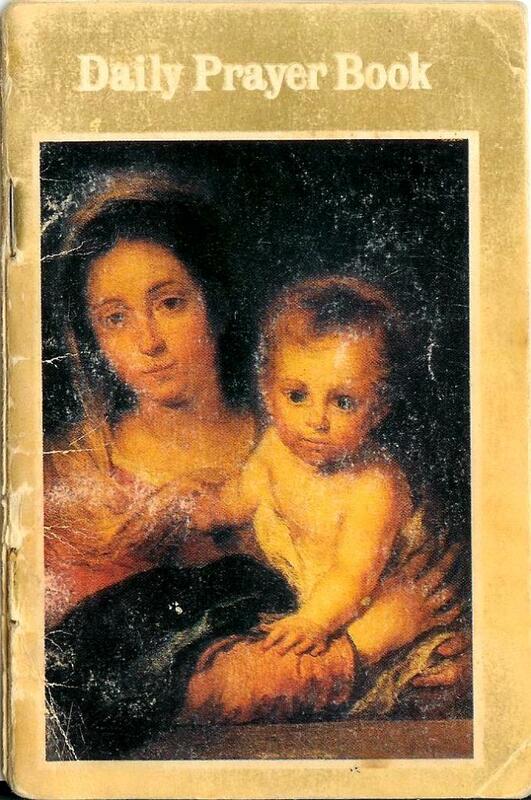 I’m a huge proponent of the Holy Infant, too. Then Ning emailed again. She’d send me information on the January celebration of the Santo Niño de Cebú at one of the area churches. Although Ning and I had ended our emailing on a happy note, the Catholic to Christian blog post continued to pester me. 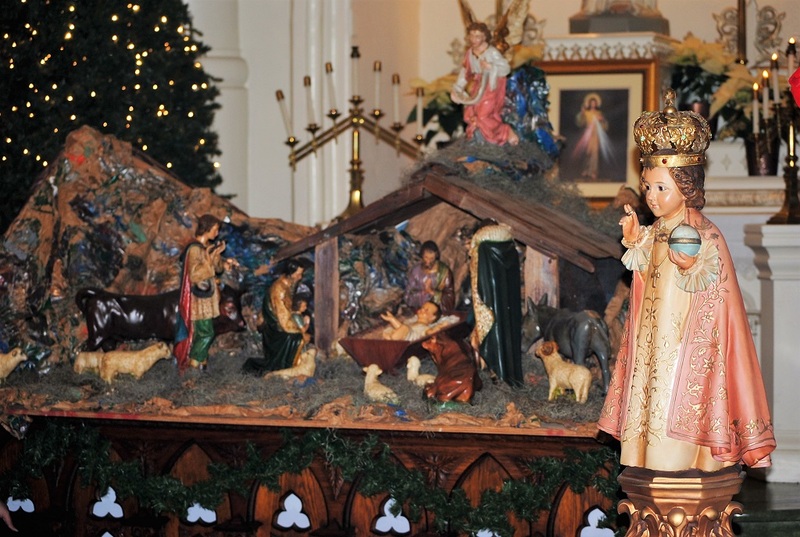 Catholic to Christian had written, first, that Catholics erroneously associate Christ with Christmas; second, that Christ was born at a time other than Christmas, so we Catholics foolishly celebrate the wrong date; and, third, that Christ’s resurrection, not his birth, is what’s important. Being a devotee of the Holy Infant, I disagree, of course. For us to have received Christ’s gift of life through his crucifixion and subsequent resurrection, Jesus had to have first been born! So it’s only natural that the Catholic Church should commemorate both of these very special seasons, Advent/Christmas and Lent/Easter, in the life of Christ during its liturgical year. Having read and reread the October 16th post, I was beyond annoyed at Catholic to Christian’s perspective. As we all know, the Roman church is not Christ’s church, and many of its teachings are completely contrary to the holy scripture and the absolute word of God…. I thank God that my story is comfort to those who have had the courage to break away from the oppressive teachings of the false church. I seriously considered adding a comment but quickly decided against it, recalling what I’d been told growing up: Better to have one fool than two. I recalled Dr. Kearney’s English history course and the decades-old image I’ve carried around of Martin Luther nailing his ninety-five theses on the church door. 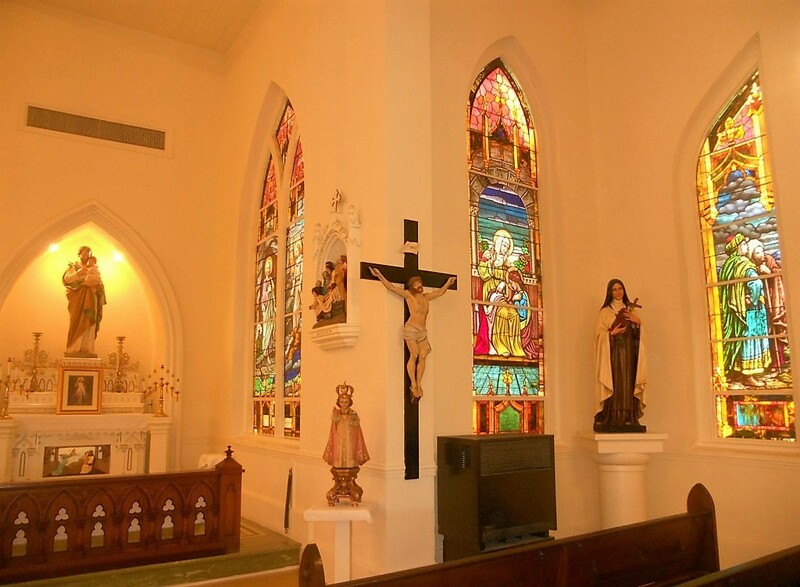 Catholicism existed before Protestantism, so why aren’t Catholics Christian? My thoughts continued to percolate through Sunday when, on the feast of Christ’s baptism, Father Xaviour’s homily focused on the two significant aspects of Christ’s life, namely his birth and his purpose for being. Father said that Christ accepted God’s master plan when he humbled himself before John the Baptist and asked to be baptized. I smiled within as I mentally repudiated Catholic to Christian’s beliefs. Through faith, we acknowledge Christ’s sacrifice on the cross for us. Despite the difficult choice he undertook, he accomplished his mission in life so that all who believe can find their way back to God through repentance and forgiveness. Moreover, if we believe in Christ, then, whether we’re Catholic or Protestant, we are Christian. Why is this so easy for me to understand yet so difficult for others to accept? Why do non-Catholic Christians always insist that we Catholics haven’t been saved? We’ve been baptized! And does our profession of faith not proclaim who we are and what we believe? Ning and I easily came to terms with our opinions of the Catholic to Christian blog post, so on Monday we were back to our usual sharing online. She forwarded a flyer from St. James the Apostle Church on the upcoming Santo Niño festivities and followed up with a printout, which Sam gave Steven at work on Wednesday. I’m so excited that I can hardly wait for tomorrow evening! 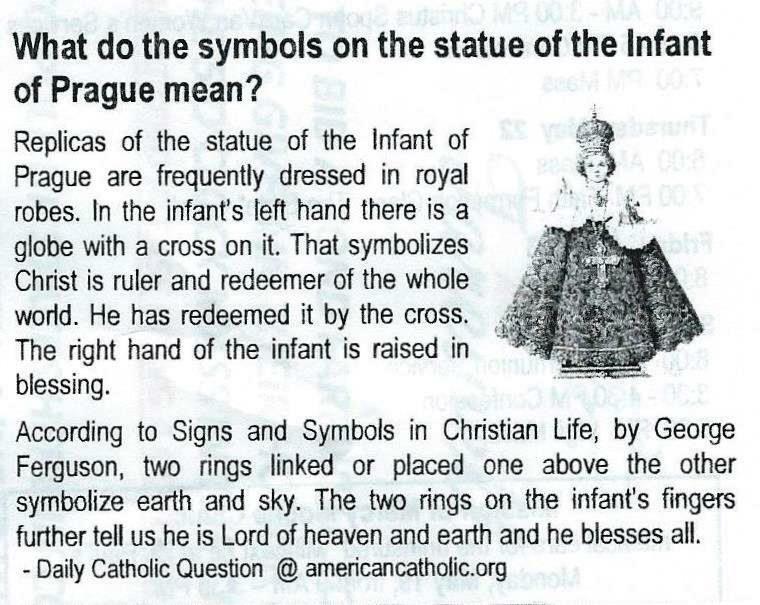 Not since Segy and I visited Our Lady of Victory in Prague have I been filled with the joy and anticipation of attending a Mass in honor of the Holy Infant. 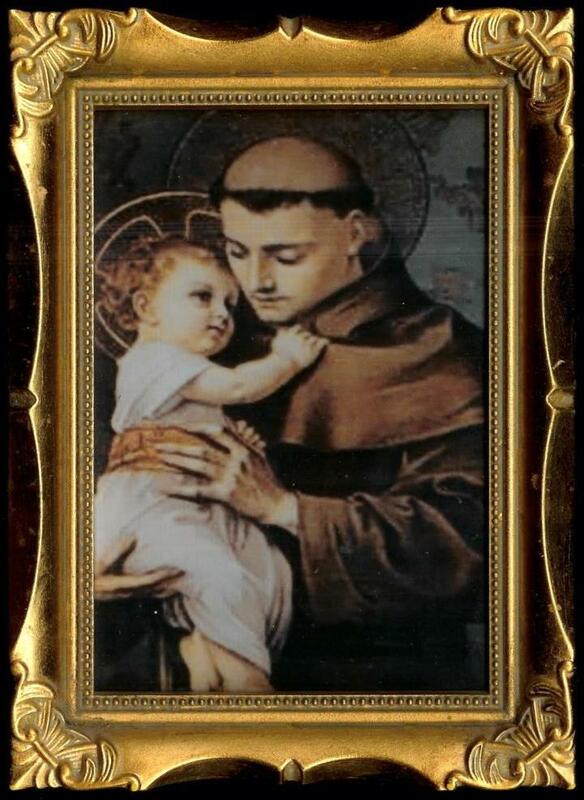 For a holy Christian life… St. Anthony, model of great holiness, help me to live as a true Christian, faithful to the promises of Baptism. You know how great are the dangers and difficulties of my life. Grant that I may overcome all temptations to evil and have the courage to witness to my faith. Obtain for me a heart that is capable of loving God above all things, ready to accept the holy will of God in sacrifice and renunciation. Open my soul to a generous and sincere love of neighbor; make me disposed to save and console anyone who is in need. Sustain me with your example so that I may be worthy of God’s friendship. Amen. For all Christians… Lord God and Father, in the death and resurrection of Jesus Christ, your son, you willed to reconcile men with each other in peace. Hear the prayer of your people. Let your spirit of life and holiness renew us in the depths of our being, unite us throughout our life to the risen Christ, for he is our brother and savior. With all Christians we seek to follow the way of the gospel. Keep us faithful to the teaching of the Church and alive to the needs of our brothers. Give us strength to work for reconciliation, unity, and peace. May those who seek the God they do not yet know discover in you the source of light and hope. May those who work for others find strength in you. May those who know you seek even further and experience the depths of your love. Forgive us our sins, deepen our faith, and enliven our hearts with love for our brothers so that we may walk in the footsteps of Christ as your beloved sons and daughters. Father of great goodness, hear in the words of your people the prayer of the Spirit for the praise of your glory and the salvation of men. Through Jesus Christ your son, our Lord, the way, the truth, and the life forever and ever. Amen. Our Lady of Brezje… Mary, help of Christians, you show us how to be Christian, how to “hear the word of God and keep it” (Luke 11:28). Help us to respond to God as you did, that his power work in us; that the Spirit form Christ in us; that his mind, heart, and will be ours. We ask this through Christ, our Lord. Amen. 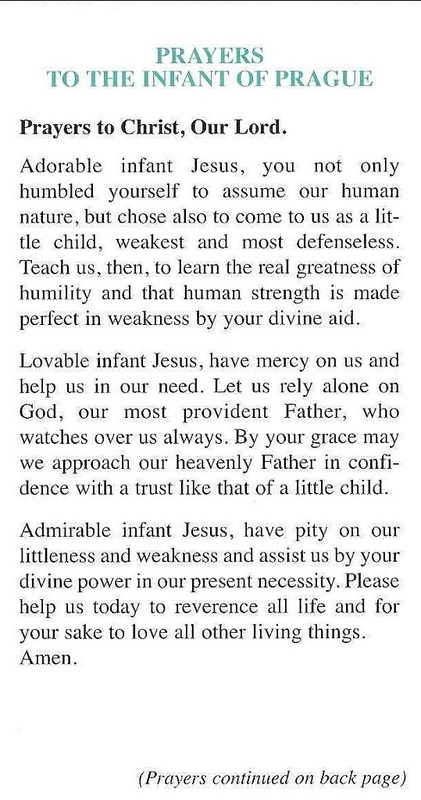 The Daily Prayer booklet is from Salesian Missions, P. O. 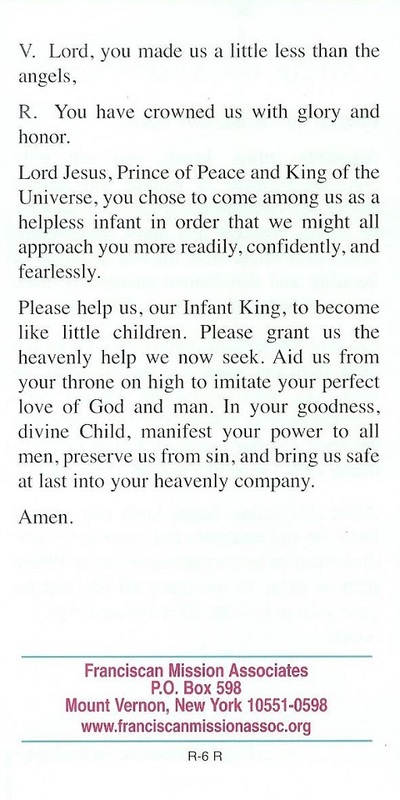 Box 30, New Rochelle, NY 10801-0030; the Infant of Prague leaflet, from Franciscan Mission Associates, P.O. Box 598, Mt. Vernon, NY 10551-0598. “Christianity is the meeting point of earth and heaven” (St. John XXIII). Remember your leaders, those who spoke to you the word of God; consider the outcome of their life, and imitate their faith. Jesus Christ is the same yesterday and today and forever. Do not be led away by diverse and strange teachings (Hebrews 13:7–9). “I believe in Christianity as I believe that the sun has risen not only because I see it, but because by it I see everything else” (C.S. Lewis). “All of us can attain to Christian virtue and holiness, no matter in what condition of life we live and no matter what our life work may be” (St. Francis de Sales). In the home it is kindness. In the business it is honesty. In society it is courtesy. In work it is fairness. Toward the unfortunate it is sympathy. Toward the weak it is help. Toward the wicked it is resistance. Toward the strong it is trust. Toward the penitent it is forgiveness. Toward the successful it is congratulation. 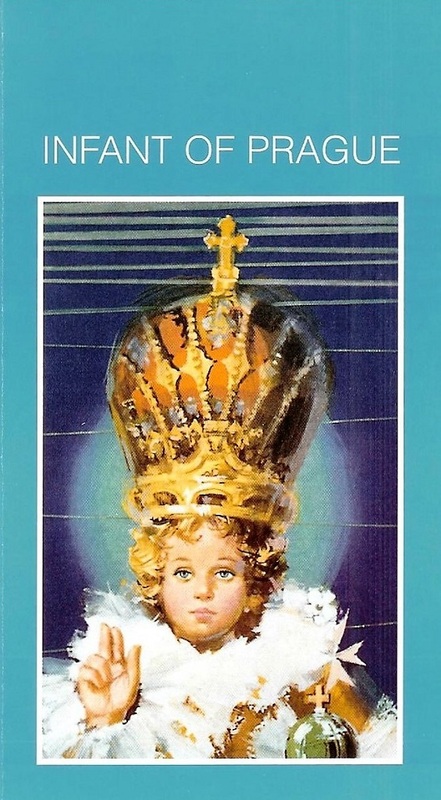 And toward God it is reverence and obedience (“Christianity” in A treasury of prayers, The Leaflet Missal Company, n. d., p. 17). My hope is in Christ, who strengthens the weakest by his divine help. I can do all in him who strengthens me. His power is infinite; and if I lean on him, it will be mine. His wisdom is infinite; and, if I look to him for counsel, I shall not be deceived. His goodness is infinite, and if my trust is stayed in him, I shall not be abandoned (St. Pius X). Changed by the working of grace into a new creature, the Christian thus sets himself to follow Christ and learns more and more within the Church to think like him, to judge like him, to act in conformity with his commandments, and to hope as he invites us to (St. John Paul II in Catechesi Tradendae). After a long and deep consideration of the divine indwelling, we begin to realize that Christianity is something we live, that it is a life given by Christ that grows, and this growth is one of union with God, who dwells as a lover within the heart of man. Human love grows; two hearts begin to beat as one, two wills to act as one. Such, also, is the love of man and God. Thinking of God within us, we begin to see things the way he sees them. We begin to will what God wills (Fr. Killian J. Healy in Awakening Your Soul to the Presence of God). “Hear me clearly: I am a Christian” (St. Polycarp). “The Christian ideal has not been tried and found wanting; it has been found difficult and left untried” (G.K. Chesterton). Christianity, if false, is of no importance and, if true, of infinite importance. The only thing it cannot be is moderately important (C.S. Lewis). “What makes a man a Christian is his faith, that inner life that awakens in him the revelation handed down to us from the very moment he receives it” (Romano Guardini in Meditations on the Christ).